My affection for stationary and shopping for new notebooks and journals is surpassed only by my love for all things classic and vintage. 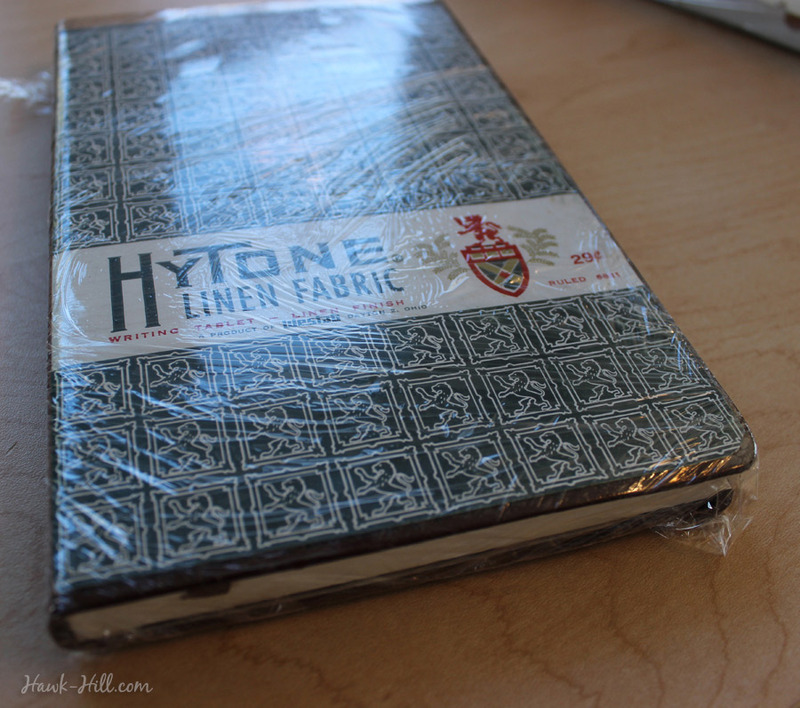 Unfortunately my requirements for a notebook in regards to paper type and binding quality means using authentically vintage journals (which I assume one could find on eBay) isn’t an option. A few years ago when I stumbled across a pile of old notebooks and writing pads in a small flea market and immediately bought every last one of them, I decided to experiment with a solution: decoupaging vintage notebook covers on moleskin and similar modern journals. The result: total success (even after months of use and the wear and tear involved in filling a journal cover to cover). I captured the process in the following tutorial, which I originally published on my pre-doodle-note blog, hawk-hill.com. Additionally, I scanned all of the covers from that flea market stationary find and have them available for download so you can recreate this project without the footwork of hunting your own vintage paper. 2. Begin by trimming your cover or reproduction of a vintage cover. You’ll want to make sure dimensions match exactly, or are slightly smaller than, the cover of your notebook. 3. Apply Glazing Medium. I prefer this product to mod podge for better adhesion with less buckling from moisture. 5. As you can see in the photo above, the corners and edges are not fully adhered to the cover. In order to make sure all the edges stick securely to the cover (super important, as the edges will take all the abuse from being carried in a book bag or shelved and reshelved) I used plastic wrap to apply constant, firm pressure to hold the label in place during drying. The plastic wrap, unlike using a weight for the same purpose, helps force the label to hug curves and contours of the cover. DO NOT APPLY GLUE/GLAZING MEDIUM ON TOP OF THE PAPER YET – a top coat will be added once the glue has set holding the new cover in place. Use plastic wrap over the decoupaged vintage cover to ensure full contact of the paper on the edges during the drying process. 6. Wait at least 4 hours, then remove the plastic wrap. (It will easily pull away from the book, even in spots where glue medium was exposed.) Allow to dry another 4 hours. 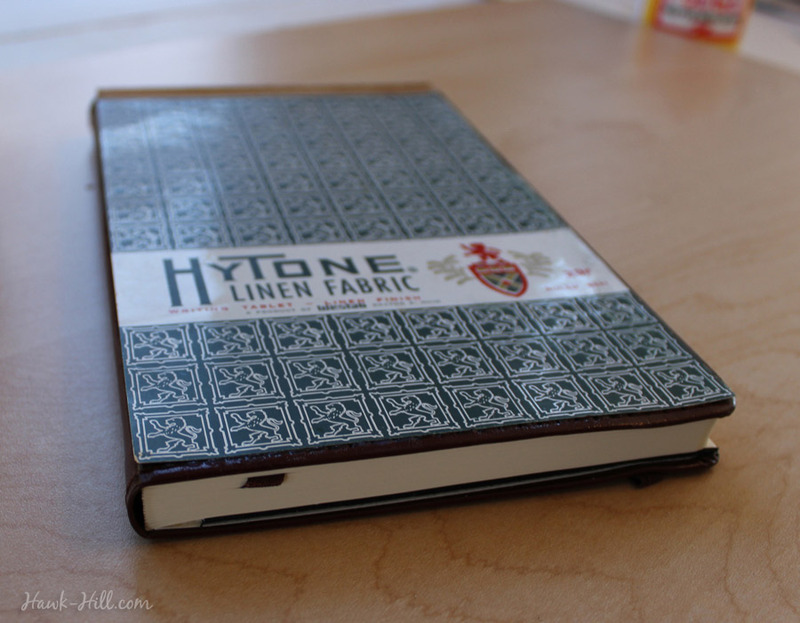 At this point, with new cover secured, you can choose to call your new faux-notebook done, or to add a protective coat of glazing media or mod podge to the top of the paper cover. An extra coat will help the cover wear longer and resist water- just be sure and use a matte finish, because a glossy finish will ruin the vintage vibe.